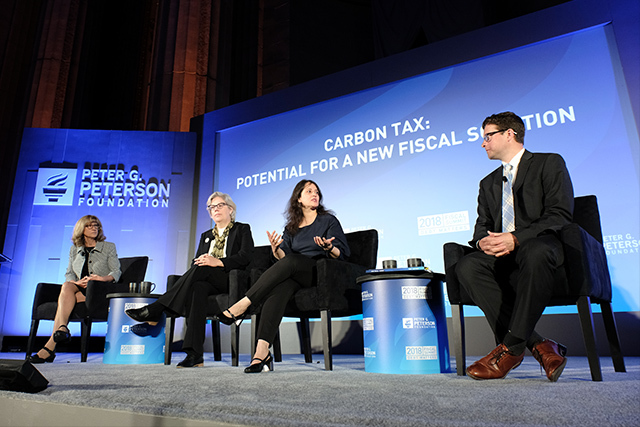 At lunch, New York Times tax and economics reporter Jim Tankersley welcomed a panel of experts to discuss the potential for a well-designed carbon tax to play a role in putting our nation on a more sustainable ﬁscal path. Tankersley was joined by two experts from diﬀerent sides of the political aisle who have written extensively on the beneﬁts of a carbon tax: Aparna Mathur, Resident Scholar in Economic Policy, American Enterprise Institute, and Adele Morris, Senior Fellow and Policy Director of Climate and Energy Economics Project, Brookings Institution. Terry Dinan, Senior Advisor, Congressional Budget Oﬃce (CBO), rounded out the panel to provide a non-partisan analysis on the ﬁscal and economic eﬀects of legislative proposals to tax carbon emissions.